Punta Mita is located near the northern edge of Banderas Bay and has been one of the most popular areas for people looking for exclusive Mexico real estate. Punta Mita real estate is highly desirable, especially among celebrities and high flyers who just want to get away and soak up the beautiful settings here in the second or third homes. Punta Mita, Mexico has always been known as a sacred place where anyone can reconnect with the spirits of Mother Nature for many, many centuries by the local groups. Once you see the beautiful lush surroundings in Punta Mita you will see why this is such a sacred and sought out place for real estate. This area has been home to many wonderful amenities and exciting activities, which include professional worldwide golfing, fine gourmet dining and 5-star resorts. Punta Mita has so many exciting things to offer everyone. Maybe, you should consider living in this beautiful and serene haven where you will feel like you are living in heaven each and every day. Why not look below to see the many attractions that Punta Mita real estate has to offer you? Punta Mita is honored to have two championship golf courses designed by Jack Nicklaus. Both of the golf courses have been featured in golf magazines, and these golf courses have been visited by golfing professionals and golfing enthusiasts. The first golf course in Punta Mita is the Pacifico. It opened in 1999 and is the most sought out and popular golf course in the area. The Pacifico Golf Course provides golfers with stunning and spectacular views, an amazing design that will leave you challenged, and of course the Pacifico has won numerous awards and the golfing world has been praised this golf course. Just imagine owning Punta Mita real estate and being able to play golf every day. For a perfect beach day, Punta Mita is the place. The waves are calming that softly graze the sandy beaches that are soft. If you just want to relax and enjoy the serene sounds of the water or you prefer to enjoy water activities like surfing or paddle boarding, then there is no better place than the beaches in Punta Mita. 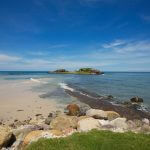 Just imagine these beaches being your local beaches with a Punta Mita real estate purchase. Puerto Vallarta is a neighboring city that receives raving reviews for its outstanding culinary due to the size of the city, but Punta Mita is a food friendly area that provides you with tacos on the streets and the finest gourmet dining, but don’t forget to try the fresh seafood too. Buying real estate in Punta Mita will keep your taste buds excited for sure. The fine arts can be found in Punta Mita. There are Mexican art that can be seen at the rotating exhibits at the Punta Minta Cultural Center, which is located at St. Regis Resort ArteMita or the Four Season Cultural Center. You will see local art that is highly impressive at the cultural events for all locals and tourists. The Pacific Ocean open waters meet the Bay of Banderas, so Punta Mita provides an aquatic home where you can retreat to many different water sports and activities. You can go scuba diving, snorkeling, exploring the coral reef, or go sport fishing where you can catch a trophy fish. If you would like to learn to surf, then there is no better place to do it than here. There are so many water adventures such as sailing, swimming, kayaking, whale watching, and many more. Are these enough reasons to relocate to paradise. Check out the real estate in Mexico.